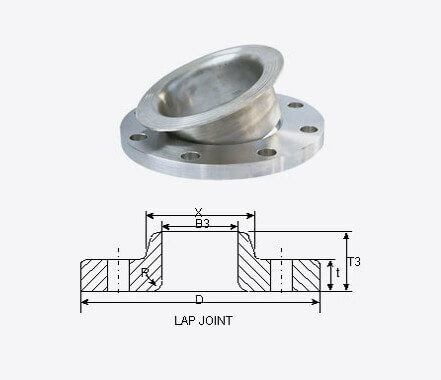 Lap Joint Flanges (Loose Flanges) are usually used in conjunction with Lap Joint Stubs. Lap Joint Flanges (Loose Flanges) in carbon or low alloy steel piping systems are best used when frequent dismantling for inspection and cleaning is required. The use of Lap Joint Flanges (Loose Flanges) at points where severe bending stress occurs should be avoided. Class: 150#, 300#,400 #,600#,900#, 1500# & 2500 #. Yaang Pipe Industry, as a first class manufacturer of Lap Joint Flanges (Loose Flanges) in China, supplys a variety of stainless steel flanges to satisfy our customers’ specifica requirements, which include different size ,different schedule, different pressure and different finish faces. Our products are produced strictly according to the required standard. Our raw material for threaded flanges all are purchased from big steel companies which can make sure the material in a high quality.